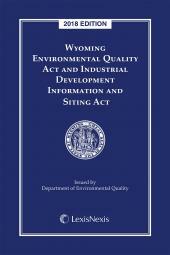 The only practical guide published on the Defense Base Act and War Hazards Compensation Act. 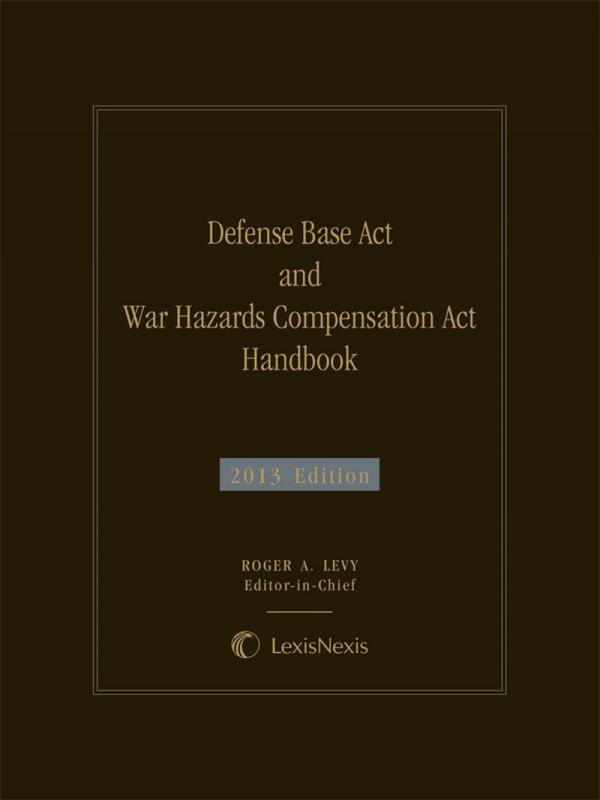 The handbook is the only practical guide published on the Defense Base Act and War Hazards Compensation Act. The two primary federal statutes which address these matters are the Defense Base Act ("DBA") [42 U.S.C.S. § 1651 et seq.] and the War Hazards Compensation Act ("WHCA") [42 U.S.C.S. § 1701 et seq.]. The general purpose of the DBA is to provide uniform and generous compensation benefits to certain civilian employees "domestic and foreign" of private companies doing work overseas in furtherance of American foreign policy. The general purpose of the WHCA is to shift to the United States government the costs of compensating certain civilian employees "domestic and foreign" of private companies who are working overseas in furtherance of American foreign policy and are injured or killed by a war risk hazard. Much has happened in the DBA world since our first and second editions went to press in 2008 and 2010. While there has been a significant wind-down of civilian contractors in Iraq, significant numbers continue to be employed to assist the efforts of the United States in its military activity in Afghanistan as well as in "public work" around the globe. Moreover, the "tail" from Iraq will be with us for many years to come. As you will see in this edition, we emphasize new case law in the areas of average weekly wage, exclusivity benefits under the DBA, adjudication and appeals and War Hazards Compensation Act. We have expanded the chapter on the War Hazards Compensation Act to include interesting "Bulletins" from the U.S. Department of Labor agencies involved with the administration of this law. We have also added a new chapter, Chapter 14, on claimant attorney fees--a topic that has been the subject of much controversy in recent years at the administrative, trial and appellate levels in both traditional Longshore and Defense Base Act cases. 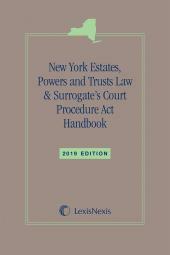 This handbook combines expert analysis of the substantive law with practice tips and other helpful tools. The handbook is written for attorneys, insurance companies, claims adjusters, judges, defense contractors, injured workers, and others. It provides the reader with a basic introduction to the Defense Base Act, its history and purpose, current events, and a list of common acronyms and terminology. The handbook discusses coverage issues, underwriting, waivers, exclusivity rules, types of benefits, the claims process, discovery issues, average weekly wage calculations, zone of special danger doctrine, commutations, settlements, and death benefits. 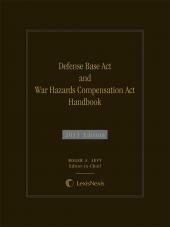 There's also a chapter on the War Hazards Compensation Act and how benefits are obtained under that Act. 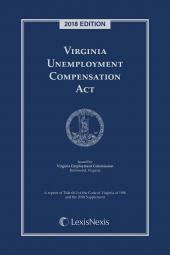 At the end of the handbook, a full reprint of Defense Base Act and War Hazards Compensation Act statutes and the Longshore Harbor and Workers' Compensation Act statutes are provided. Roger A. Levy is presently of counsel and former partner with Laughlin, Falbo, Levy & Moresi, LLP, in San Francisco, California. Mr. Levy has been a practicing attorney in the state of California since January of 1970. During that time he has devoted his practice almost entirely to work-place injuries. He first represented claimants, then joined the defense firm of Sedgwick, Detert, Moran and Arnold in 1973 and became a partner five years later. There he concentrated on defending California state matters until the 1972 amendments to the LHWCA took hold, at which time he changed his focus to federal cases. In 1985 he became a founding partner in Laughlin, Falbo, Levy & Moresi, the nation's largest firm whose practice is devoted exclusively to the defense of workers' compensation cases. There he has continued his emphasis on the LHWCA and related matters. He has presented at numerous conferences and seminars throughout the country on issues including LHWCA jurisdiction, third-party remedies, mediation, the Defense Base Act, and War Hazards Compensation Act, and has authored numerous articles and publications on these subjects. Joshua T. Gillelan II, Longshore Claimants' National Law Center, Washington, D.C.
William B. Newton, Ashcraft & Gerel, LLP, Washington, D.C.
Mark L. Schaffer, Ashcraft & Gerel, LLP, Washington, D.C.